Ex-5. (F)/123 aircraft. Detached to St. Kaatsch by 25.08.44, fuel pump unserviceable on 28.09.44. Engine change with 5. (F)/123 on 14.10.44. In Niedermendig on 31.12.44, on strength of 3./NAG 1. Given up by 3./NAG 1 to 3./NAG 13 on 03.01.45: described as G-5 with DB 605 ASM, 1 x MG 151/20, Rb 50/30, FuG 16 ZS. Listed as serviceable but "detached" from 3./NAG 1 on 07.01.45. On 11.01.45, 3./NAG 1 asked whether this a/c (again described as a Bf 109 G-5) should be ferried from Twente to 3./NAG 13. Listed as "detached" at 16.30 hrs. that day, it was transferred on 12.01.45. On 15.01.45 (now described as a G-6) it was reported as given up to 3./NAG 13, with DB 605 ASM engine, 1 x MG 151 cannon, an Rb 50/30 camera and FuG 16 ZS radio. On 22.01.45, 3./NAG 1 reported taking this aircraft over from 3./NAG 13. Equipment as above, plus FuG 17 and "methanol installation." On 15.02.45 reported u/s by 3./NAG 1 (change of oleo leg); “off station” on 09.03.45; u/s 25.03.45. Reported 100% damaged, missing, in strength return of 29.03.45. One of seven Bf 109 G-6/AS taken over by 4. (F)/123 from the Guyancourt Workshop on 13.08.44: all had MW 50, Rb 50/30 camera, 1 x MG 151/20, Fu.Ge. 16 Z and Fu.Ge. 25A installation sets without equipment. Destroyed on 27.08.44 according to data card recovered by Allied troops. Ex-4. (F)/123 aircraft. Destroyed by strafing at Dijon, 27.08.44. NOTE: Blue 7 was almost certainly W.Nr. 26043 since their reported date of destruction is the same and only one 4. (F)/123 machine is recorded as being detached to Dijon. Ex-JGr. 200? Listed as u/s (shot up?) in a report of 29.08.44. Perhaps not built for reconnaissance as the next machine off the assembly line, 160756, had been flown to the Allies in Italy by a French defector from 3./JG 4 on 25.07.44 and is now in the US National Air & Space Museum. Oblt. Theodor Spiess shot down and killed by American AA on 28.08.44, at Charsac. Aircraft allocated to II./JG 11 on 23.12.43 as new construction JaboRei. Taken over by 5. (F)/123 from Guyancourt on 05.08.44, detached to Kaatsch by 25.08.44; fitted with ASM engine and Rb 50/30. Ex-5. (F)/123 aircraft. Detached to Kaatsch by 25.08.44; unserviceable with engine damage on 30.09.44. Ex-5. (F)/123 aircraft, Rb 50/30 camera. 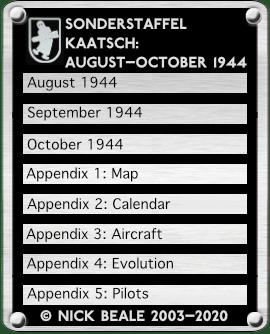 Taken over from Guyancourt on 05.08.44, detached to Kaatsch by 25.08.44. Unserviceable "shot up/change of wings" on 28.09.44. Allocated to 2./Erg.JGr. Ost on 11.10.44 (from Freiburg) and to 1. (F)/121 on 18.10.44. Crashed 18 km. west of Dijon on 30.08.44. Werk Nummer as reported but possibly incorrect (perhaps 165433)? Ex-5. (F)/123 aircraft. Fitted with MW 50. Instructions to collect from Erla, Antwerp and ferry to Guyancourt on 19.06.44, detached to St. Kaatsch with Ltn. Weber on 23.08.44 but listed as unserviceable with 5. (F)/123 on the afternoon of the 25th and subsequently. Given up by 5. (F)/123 to Plantlünne airfield workshop on 16.10.44. On 04.01.45 at Plantlünne, belonging to Luftflotte Reich; mentioned there again on 06.01.45. Accepted from Plantlünne by 3./NAG 1 on 11.01.45; had DB 605 ASM, 1 x MG 151/20 and 2 x MG 131 but “wireless and photographic installation are lacking.” However, listed as serviceable at 16.30 hrs. that day. To 3./NAG 13 on 12.01.45, now fitted with FuG 16 ZS. On 15.01.45 equipment also included an Rb 50/30. On 29.01.45 taken over by 3./NAG 1. Equipment as above, plus FuG 17 and "methanol installation." Shot down by Spitfires of No. 2 Squadron near Zutphen, Netherlands on 10.02.45, pilot (Uffz. Anton Mittermeyer) killed. Marking also reported as “Black 19 + 63.” Handed over, 96% damaged, to a Salvage Battalion in Twente. Unserviceable, "landing gear damage", on 28.09.44. Allocated to 2./Erg.JGr. Ost on 11.10.44 (from Freiburg). Unserviceable on 28.09.44. (Bf 109 G-6/U4 series Werk Nummer, so possibly an ex-JGr. 200 machine). Unserviceable on 28.09.44 pending change of engine. Allocated to 2./Erg.JGr. Ost on 11.10.44 (from Freiburg). (Bf 109 G-6/U4 series Werk Nummer, so possibly an ex-JGr. 200 machine). Unserviceable on 28.09.44 due to engine damage. (Bf 109 G-6/U4 series Werk Nummer, so possibly an ex-JGr. 200 machine). Shot down by P-47 north of Lyon on 29.08.44, Ofw. Weller killed. (Bf 109 G-6/U4 series Werk Nummer, so possibly an ex-3./JGr. 200 machine). Unserviceable, "wiring out of action", on 28.09.44. On 15.10.44, 4. (F)/123 was ordered to surrender this a/c (awaiting collection in Niedermendig) to 1.(F)/121. NOTE: Leutnant Heinz Moschke logged flights in aircraft with tactical markings 1, 2, 3, 7, 8, 11 (a Bf 109 G-6/U4), 30 and 33 but these cannot be matched with specific Werk Nummern. The "7" he flew was not "blue 7" above, since that machine had been destroyed prior to the flights in his log; "30" and "33" are likely to have been Bf 109s from 5. (F)/123 since that Staffel commonly used high double-digit numbers. He often flew an "11" (red?) with 2./JGr. 200 and may well have brought that Bf 109 to Kaatsch. The single-digit machines could well have come from JGr. 200 too.